As the use of technology improves and broadens, bandwidth demand continues to outpace its deployment. What will the future hold if our communication channels continue to serve as our bottleneck? Communications sits at an impasse. 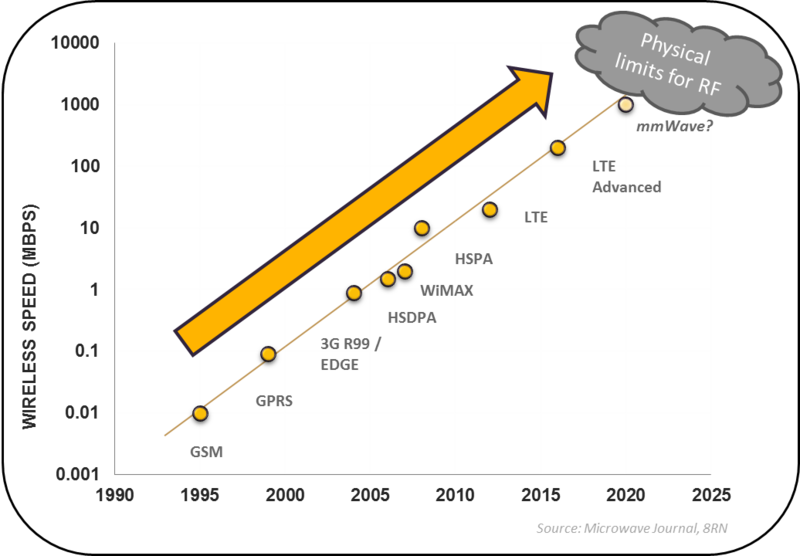 Today, our computing demands continue to outpace the capacity of our networks. The problem is rooted in a fundamental disconnect between the rate at which bandwidth grows and the rate at which computing power grows. Decades of historical data show that our internet bandwidth increases roughly with Nielsen’s Law, which predicts that bandwidth grows at a rate of 50% annually, in both the wireless and wired worlds. Contrast this capacity with Moore’s Law, which states the growth rate of computing power – a corollary for demand – is around 60% annually. With these growth rates, bandwidth will increase by a factor of 57X in the next 10 years, close to half the projected increase in computing power of 100X. This situation of supply and demand for bandwidth has resulted in compounding strain on networks. Decades ago, wireline industry leaders and engineers saw the strain and sought out a better, broader solution. They realized that they had to move away from sending radio frequencies over copper and coax, and instead move to sending light signals through glass, technology today we call fiber optics. Today, all of the backbone networks of the internet are run on fiber optics, which serve as a platform to continuously feed the insatiable demand for bandwidth in that part of the network. Bandwidth will increase by a factor of 57X in the next 10 years, close to half of the projected increase in computing power of 100X. Wireless technology development parallels that of the wired network, as technology has moved to fit more data through the air over time. Going back to 2000, wide-area network or cellular signals have moved through multiple standards utilizing different parts of the spectrum and increasingly complex modulation and encoding techniques… moving through 3G, HSDPA, WiMAX, HSPA, LTE and now advanced LTE. In this evolution, theoretical single user speeds have jumped from 0.1 Mbps at the turn of the century to the ~50 Mbps that they are today with LTE. One way to make up difference between Moore’s Law and Nielsen’s Law in the wireless world is to jump up the fundamentally limited radio frequency spectrum. Historically the jumps from radio broadcast to TV broadcast to cellular wavelength were leaps in search of more bandwidth to support new applications…accompanied by the requisite political and regulatory wrangling. Nearly all of this spectrum is currently allocated to a specific use. 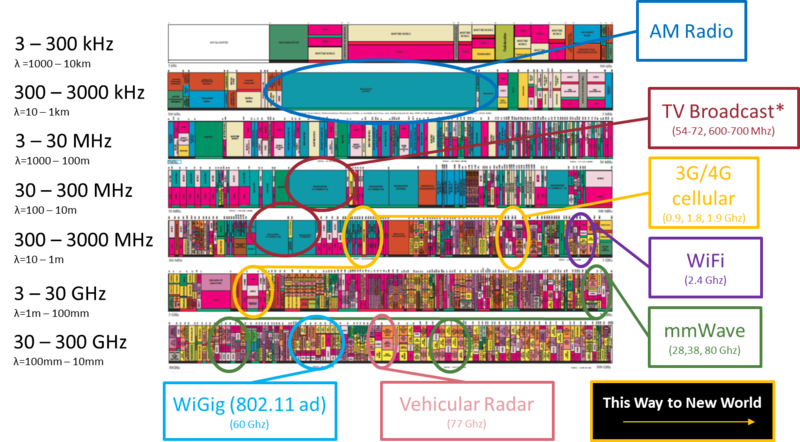 Some unlicensed bands, like 2.4 Ghz, is becoming increasingly crowded, and others like the 700 Mhz is auctioned to large cell carriers for > $19bn. Another way to make up difference between Moore’s Law and Nielsen’s Law is to remove the prohibitive cost of upgrading networks. In the wired universe in the “last-mile”, there is an understandable unwillingness to replace the extensive cable infrastructure with new fiber optic wires due to the significant cost. In spite of this, billions are spent yearly laying down the small stretches of fiber to connect end-users to broadband access. In this cost were lower, gigabit could become a reality to many more people much more quickly. Current rates of development fail to support the demand that is driven by enormous amounts of computing power. Unfortunately, the physical limits today’s infrastructure fail to support the increasing demand. Fiber is too expensive to take to every household… even optimistic projections have gigabit speeds failing to reach even 50% of homes over the next decade. In wireless, the move to 5G promises to take us to 100 Mbps, but even that promise is wrought with risk. In particular, the risk of scarce licensed spectrum and unlicensed spectrum over-crowding. What is needed is a revolution in the way that our data is transferred, just as happened in the wireline world decades ago. If the present is any indication, the global desire for internet connectivity is far from satiated and will require innovative technology leaps to provide for current and worldwide future demand. Current communication technology operates on a tapped and aging complicated regulatory system. What if communications entered a new frontier of connectivity? 8 Rivers Networks addresses these problems by offering high speed, wireless mesh networks that can operate at distances experience in the “last mile”. It avoids the regulatory issues of the radio frequency spectrum by implementing communication through rapid pulses of harmless infrared light, providing an easy-to-deploy platform to get infrastructure providers the sorely needed bandwidth. The low cost of endpoint devices enables access to a greater swath of the population, providing the leap necessary to eliminate the bandwidth bottleneck.